Earn $2.19 in Rewards credit (219 points) What's This? Space can be at a premium while you're out riding, but flats happen whether or not you're carrying the proper equipment to deal with them. The Portland Design Works Tiny Object CO2 Inflator ensures you can travel prepared without carrying bulky hand pumps with its incredibly compact design yet intuitive function. 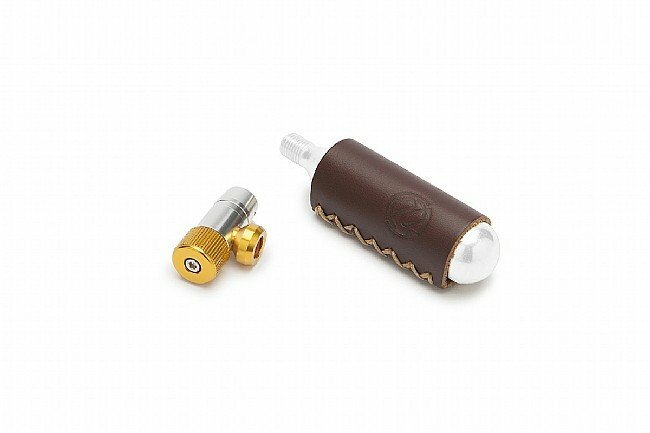 Simply thread in a CO2 cartridge, slide the chuck onto your Presta valve inner tube, and adjust the flow of air with the regulator dial. It even includes a full-grain leather sleeve to keep your hands from feeling the chill of the CO2 cartridge as it discharges. Alloy construction. Compatible with threaded CO2 cartridges and Presta valves only. works well with adjustment knob. Leather helps w the cold. Good looking combo set.